Moraea acocksii is a rare, localized and very poorly known species, but it is not suspected to be in danger of extinction. Field surveys are needed to relocate it in the wild, as it has not been seen since 1957. The threats to this species are unknown. It occurs in a remote and botanically relatively poorly explored area, and has not been observed in the wild in more than 50 years. The area where it was last recorded is now mostly within a protected area, and therefore there should not be any current threats to the population. It is not known whether there were any threats prior to the expansion of the Namaqua National Park that may have led to a decline in the population. There is relatively little human impact within the area, apart from livestock grazing. It is not known what the impact of grazing is on this species, but close relatives such as Moraea teretifolia appears to be resilient to grazing. This species is known from a single collection dating from 1957, when it was noted to be locally common. It has not been recorded since, but may be overlooked as it was only recently separated from the widespread and common Moraea saxicola (Goldblatt and Manning 2014). 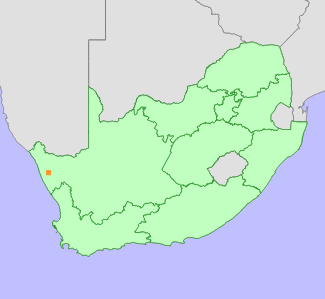 Although the exact locality is somewhat uncertain, it is likely to have been collected in the northern parts of the Namaqualand National Park, and thus the population may be safe. Field surveys are needed to relocate this species in the wild, and determine the status, size and trends of the population.